A few days ago I wrote up a review for Interactive iPad book for kids - Elfishki and The Giant Cake. You can see the REVIEW HERE. The kiddos and I really like this book. Its very interactive, and I like the read option. The voice is understandable and reads at the right pace for a kiddo to follow along! The sponsors of the review Eflishki iPad Kids Book Video has graciously offered to give 3 of my readers their own copy of the iPad book! Even if you don't win the interactive book is only $2.99! You must own an iPad or iPad 2 in order to download the book. 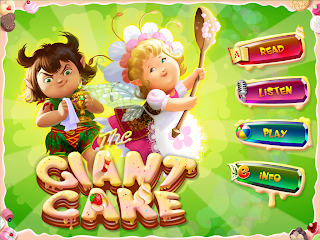 disclosure~ I was provided a code to download the Interactive iPad book for kids - Elfishki and The Giant Cake in exchange for my review. I was here and entered! Yea where do I leave my info?